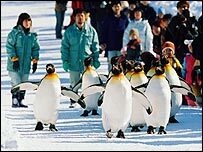 Asahiyama Zoo on the northern island of Hokkaido take its King Penguins on a 500-metre walk twice a day to stop them getting too fat during the cold months. Spokesman Tetsuo Yamazaki said penguins gained weight in winter because they stood still to conserve energy. The exercise programme takes place between December and the Spring. "Just like in humans... the fat accumulates during the winter months, and the blood-sugar level rises," Mr Yamazaki said. The penguins can only be taken on walks during the snowy months because their feet are unsuitable for walking on other surfaces, Mr Yamazaki said.